E-mail button is available after configuring outgoing account. Qtmail is the default mail application on Om 2008.8. It is called Messages on the main screen. 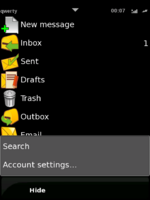 Qtmail supports POP3, IMAP, SMTP, SMS, MMS, EMS. To send e-mail you need to set up at least one outgoing e-mail account. After this setup you can start sending e-mails from your Contacts list too.